Let us imagine that we are observing a star that rotates around a supermassive black hole (whose mass is millions of times that of the Sun). It will not continue to orbit forever, in fact even if we exclude the effects of friction caused by interaction with the gas, its orbital motion will slow down till it falls, following a spiral orbit, into the black hole. The cause is the emission of gravitational waves that make the star lose energy. Obviously, the question that arises spontaneously is: what are gravitational waves? In the General Theory of Relativity, Einstein also foresaw, besides the concept of space-time and its deformation as a measure of the force of gravity, the existence of gravitational waves. To imagine what they are is not simple. The rigorous definition describes them as “perturbations of the gravitational field which spread out at the speed of light”. According to Einstein the shape of space-time depends on the distribution of the mass which is present in it: the material deforms the fabric of space-time as if it was an invisible sheet on which a ball is placed. If the distribution of the material is modified, for example if two black holes collide, as a consequence the shape of space-time will change. This variation does not reflect instantly on the entire Universe, but propagates from the spot where it has origin, at the speed of light. Which is like what happens when we throw a stone in a pond, ripples are generated outwards, from the point where the stone comes into contact with the water. This perturbation, that travels at the speed of light, is called a gravitational wave. Here is a practical example so that you will understand how to generate gravitational waves by yourself. Take two heavy balls and connect them with a tube, then make them rotate around an axis that is perpendicular to the tube. Let us consider we have completely eliminated the effects of friction: according to the Theory of Relativity, the rotational energy will decrease and the amount that is subtracted will be emitted in the form of gravitational waves. Up to this point it seems easy, it is a pity though that gravitational waves are extremely weak and that events that can generate them are very rare. In fact it is estimated that these occur once every 10,000 years per galaxy, even though recent studies indicate that these events are much more frequent and perhaps we will be able to observe the first gravitational waves around 2016. Furthermore gravitational waves interact very mildly with matter and therefore they travel undisturbed in space without being absorbed by the stars or by interstellar matter. For example, if a gravitational wave crosses the Sun it will lose only one ten millionth of a billion of its energy. Thus detection of these wave creates enormous physical and technological problems. In fact, after over 40 years of research, we only have an indirect proof of their existence. Indirect evidence of the existence of gravitational waves is obtained by observing a system that loses energy due to the emission of gravitational waves. This is what occurred in 1974 when the astrophysicists Russel Hulse and Joseph Taylor discovered the binary pulsar PSR B1913+16. For their studies, the two astrophysicists were awarded the Nobel prize for physics in 1993. A pulsar is a rotating neutron star that emits impulses, especially in radio-waves and X-rays, with a regular frequency. Very often it is compared to a lighthouse beam because emission takes place only in two directions. Binary pulsar means that it is in a binary system, consisting of two objects, the pulsar and a companion, another pulsar, and both rotate around a common centre of mass. The time taken by pulsar PSR B1913+16 to make a complete orbit (defined orbital period) was calculated to be approximately eight hours. Subsequently a decrease in this period was noted. This was considered to be due to a contraction in the orbit and therefore an increase in the orbital motion. The two pulsars, therefore, were travelling on spiral paths that would inexorably lead them to collide with one another. The shortening of the orbit implies a constant decrease in gravitational energy, which has been explained with the emission of gravitational waves. The data collected by Russel Hulse and Joseph Taylor complied closely with the General Theory of Relativity. However even if this discovery was an enormous success and a further proof of the validity of the Theory of Relativity, to show that gravitational waves are a real physical phenomenon, direct proof of their existence must be found. Today, gravitational wave detection methods substantially exploit two types of instruments. In both instruments, the variations induced by the wave are far less than the size of an atom. Gravitational wave antennas consist of a solid cylinder, a few metres long, weighing a few tons, hanging on a wire. The first gravitational wave antenna was designed by the American physicist Joseph Weber in1965. Its operation is simple and elegant. When a gravitational wave cuts the cylinder perpendicularly to the cylinder’s axis, it will start to oscillate, like a diapason. In Italy INFN, the Italian National Institute of Nuclear Physics has realized two gravitational wave antennas, Nautilus and Auriga in the laboratories in Frascati and Legnaro. In order to decrease the background noise caused by thermal agitation, and therefore TO increase the sensitivity of the instrument, the antennas are cooled to temperatures around a few degrees Kelvin. Then highly efficient shock absorbers and suspensions are used to eliminate the noise cause by traffic, and any microseismic events, or even simple trampling noises. Nautilus is one of the most sensitive devices built till now, it can measure variations in the length of the antenna equal to 10-18 m, that is the size of the nucleus of an atom. 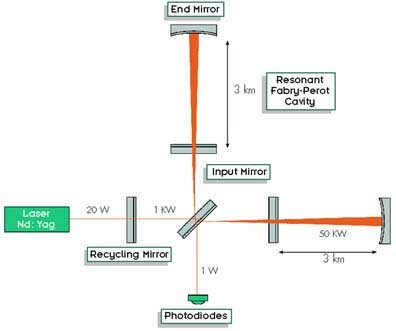 The principle of the operation of gravitational interferometers is substantially based on the Michelson-Morley interferometer model, developed in 1887 to show the non-existence of ether. The interferometer has two identical arms or paths, perpendicular to each other, in vacuum conditions. A highly stabilized laser beam is split into two paths. At the end of the arms are two mirrors that reflect the laser beams towards where the arms cross and they recombine giving place to interference. Since the two paths are identical and the beams split at the same time, if we position a detector where the arms cross, we would simply observe the original red light of the laser. The arms are purposely made of slightly different lengths so as to create interference fringes. The sensor is positioned in a dark fringe. The reason is very simple: to measure a change from dark to light is much easier than evaluating variations in luminosity. According to the Theory of Relativity, gravitational waves have a polarization. i.e. they have a precise direction of oscillation during their propagating motion. 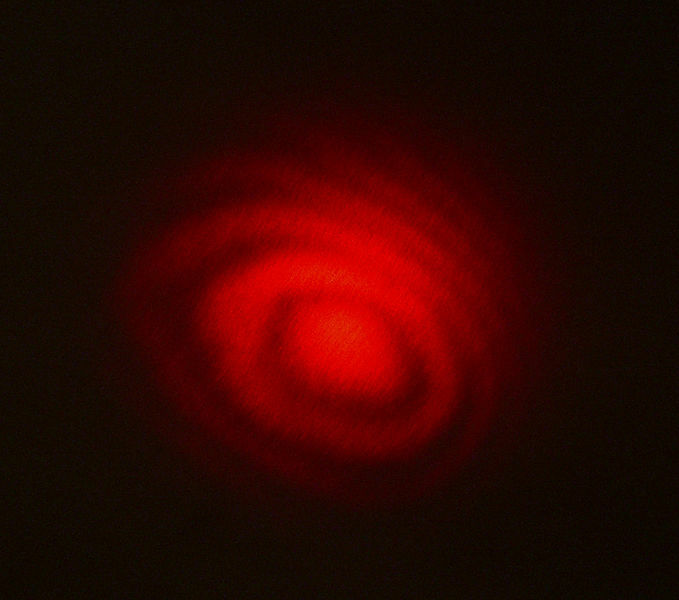 When a wave invests the interferometer, an arm contracts while the other becomes elongated. As a consequence, the two luminous beams travel along paths that are different from the original ones. Therefore the interference figure will change and the sensor will record any signal. If the gravitational waves were not polarized, the two arms would deform in the same way, and consequently the sensor would continue not to record any signal. 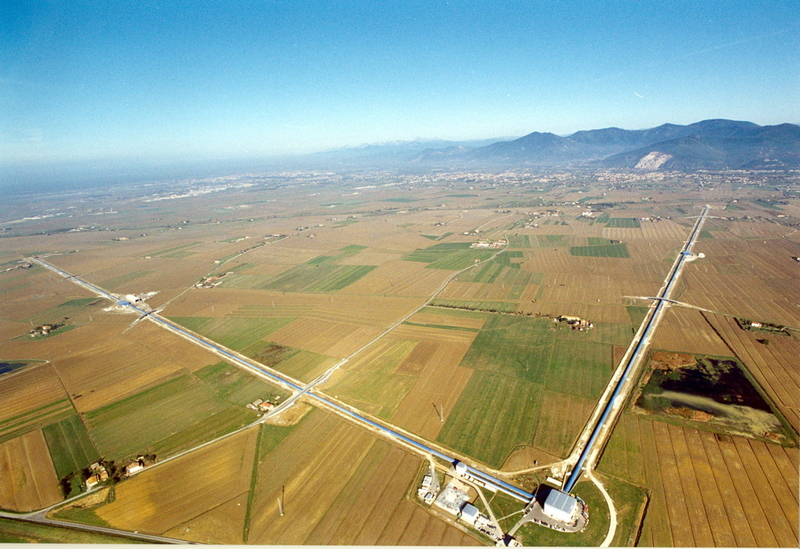 In Italy, since 2003, there is an interferometer in Cascina, in the province of Pisa, and its name is VIRGO. 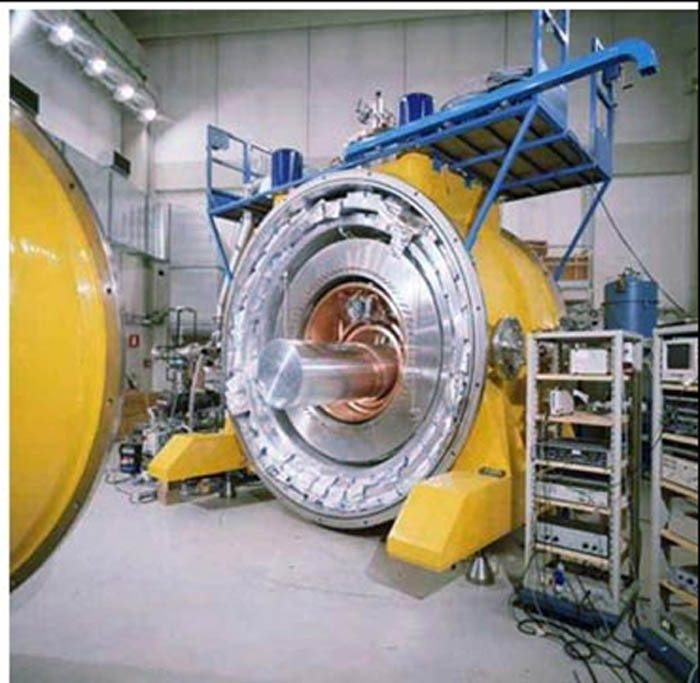 The instrument was created with the help of the funds of Istituto Nazionale di Fisica Nucleare, the Italian National Institute of Nuclear Physics. It was born as an Italian-French project, and has now been re-baptized EGO (European Gravitational Observatory) as it has gained a European status. VIRGO consists of two perpendicular arms, that are 3 km long. Using the suited instruments, it is possible to obtain repeated reflections of the beams, and in this way to increase the optical path of the beam up to 120 km. The Interferometer is isolated from all external disturbances so that it becomes sensitive only to the gravitational waves. VIRGO is able to record the signal of sources that even come from external galaxies up to a distance of 60 million light years, which coincides with the distance of the Virgo cluster, from which its name derives. It operates 24 hours a day in order to maximize the probability of capturing some signal coming from any type of source of gravitational waves, (supernovas, supermassive black holes, pulsars, binary pulsars…). It is connected to other two interferometers in the world, in order to create a network to cross check the detection of gravitational waves. The two interferometers belong to the LIGO (Laser Interferometer Gravitational-Wave Observatory) collaboration, an American observatory made up from LIGO-Hanford, in Richland, in the State of Washington and LIGO-Louisiana in Livingston, however an updated version called Advanced-LIGO is being created. In the future also LIGO-India and the Japanese Kagra (Kamioka Gravitational wave detector) also known as LCGT (Large-scale Cryogenic Gravitational wave Telescope) will join the network. Unfortunately, even if the network of interferometers might succeed in detecting the gravitational waves, nothing will be able to tell us about the place they originated from. This is because with these instruments we are able to understand that we have been struck by a wave, but we are not able to see which source generated it. 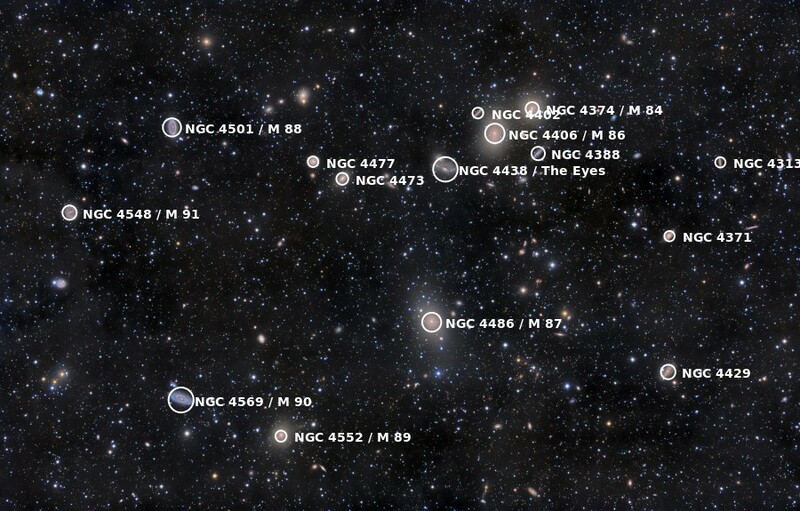 In order to obtain this information it will be necessary to scan the sky with telescopes, paying greater attention, an operation that will require a synergy among astronomers.